This week has been GORGEOUS. The sun was out and it was in the mid-60’s. This combination created a palpable giddiness in the entire city. It was like everyone was suddenly in a good mood! Me included! It was such a nice day and I didn’t need a jacket. In fact, wear jeans was a little toasty–capris would have been nice. I got home from work and played with Bella in the yard and then took her for a quick walk before heading to the Warrior Room. I almost cancelled the class because it was SO NICE. I considered going for a bike ride instead but I went to the class and I’m glad I did. It was a fantastic class! It was the 1/2 Tabata, 1/2 Isolation class. We did squats, squat jumps, burpees, up/downs, deadlifts, goblet squats, two armed swing, and running. Even though I ran at the gym the day before (unfortunately it was the treadmill) doing the C25K, I went out for a jog with everyone else because it was just so nice outside. After that I went home to clean up and Michael got home from work, also in a great mood. We decided to go out to dinner to celebrate some stuff that recently happened (more on that soon). Some of the good stuff I can share is that my promotion is still pending (they move very slowly) but I am still happy I’m being promoted. I just don’t have a date yet. Also, my cousin Anna and I are booking a girl’s weekend trip to Vegas soon! I CAN’T WAIT! Michael and I went to Pronto Pizza for dinner. We both wanted to check it out after hearing good things about it and Amy from EatingMyWayThruPortland loved it. The restaurant is in a little strip mall and has that strip mall feel to it. That wasn’t great but I’m glad we tried it and didn’t let that scare us off. The service was fast and friendly. I started with a beer from a local brewery (it’s been ages since I had a beer). I got the Breakside IPA and loved it. They even carried gluten free beer (which Michael got). We split a small salad. As soon as the waitress said “brussels sprout salad” I knew I wanted it. I love Brussels Sprouts! The sprouts were grilled and had a smoky flavor. 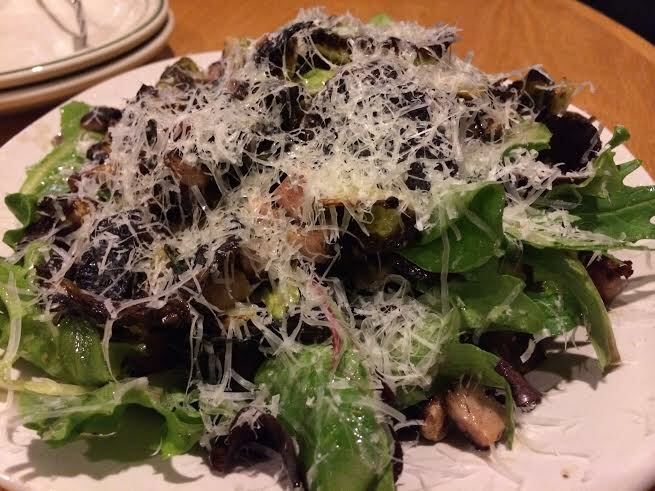 The warm sprouts topped the cold leafy salad and there were walnuts and small cubes of ham on the salad. I’m glad we split the salad for two reasons: 1) the small was actually quite large and 2) it was my favorite part of the meal. The salad was fantastic and complex! The pizza we ordered was the Clackamas. 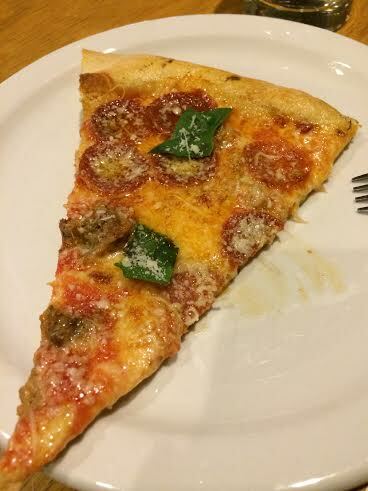 It came with pepperoni, house-made pork sausage, mozzarella, Parmesan cheese and fresh basil. The style was similar to Apizza Scholl’s. While I liked the pizza, I didn’t love it. 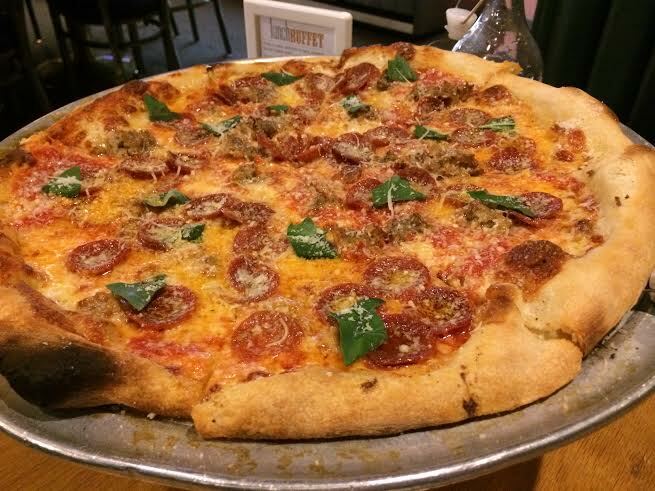 The crust was thin and crispy, the flavors were pretty good but the sausage was overpowering. It was really all I tasted. I would definitely return to Pronto Pizza and try some of their other pizzas. I especially want to try their white pies. Those sounded so great! UPDATE: I just had a piece of leftover pizza for lunch and it’s better as a leftover! Very tasty indeed. I am so ready for summer!!! That’s just cruel!! Nice weather and then SNOW?!?! Yay – we’re so excited about your good news! OMG that pizza looks good. Sorry it wasn’t the BEST but even subpar pizza is better than nothing sometimes. We just had two glorious days here. One I took one as a sick day bc I had a sore throat and I’ve been super tired, but we managed to take Max for a walk to the groomer’s. I’ve been running out of the house without a coat and finally put my gloves away. YAY!!!! It was decent pizza. Definitely not bad. Sorry you were sick! That’s a bummer when the weather is nicer. This week has been AMAZING! Yesterday I walked the pups in shorts and a t-shirt and felt too warm. Granted, that was in full sun, but still…spring is coming!! I am so ready for nice hiking weather! Isn’t that salad so so good? Next time order the Sellwood it was off the charts amazing with flavor. You also make any of the white pies with red sauce. The gal I was with always orders the Sellwood with red sauce, just so you know. The salad was amazing! Loved it. I would definitely try the Sellwood. It was one I was considering last night. Hopefully your spring weather will make it our way soon – so sick of seeing all the dirty snow on the ground. Hooray for good news, pizza AND beer! Hugs! 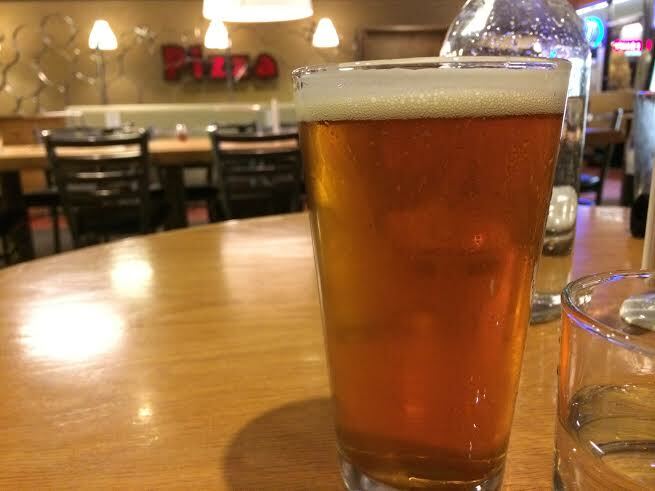 Beer & Pizza = perfect combo! I hope you guys get some nice weather soon! Congratulations on your weight loss! I love to read inspiring stories to keep me motivated. 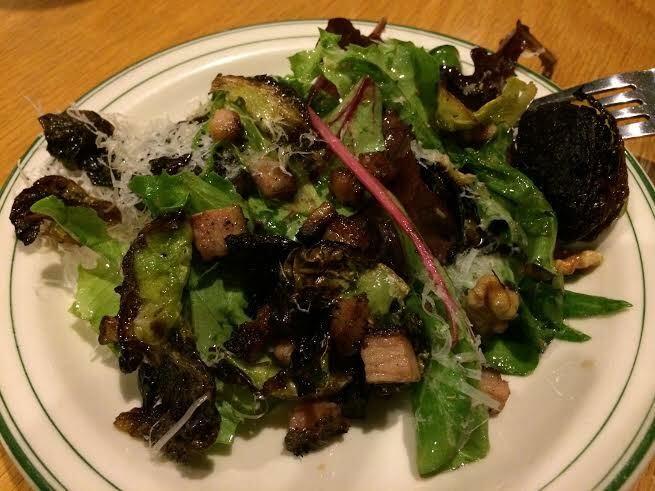 🙂 That salad sounds great – I have developed a love for Brussels sprouts that my childhood self would have scoffed at. Thank you very much! I agree, love Brussels Sprouts. I never had them as a kid. Love that park. It looks just so picture perfect and the perfect place to take a walk. I LOVE the fall but something about the spring makes me feel pretty giddy as well!! 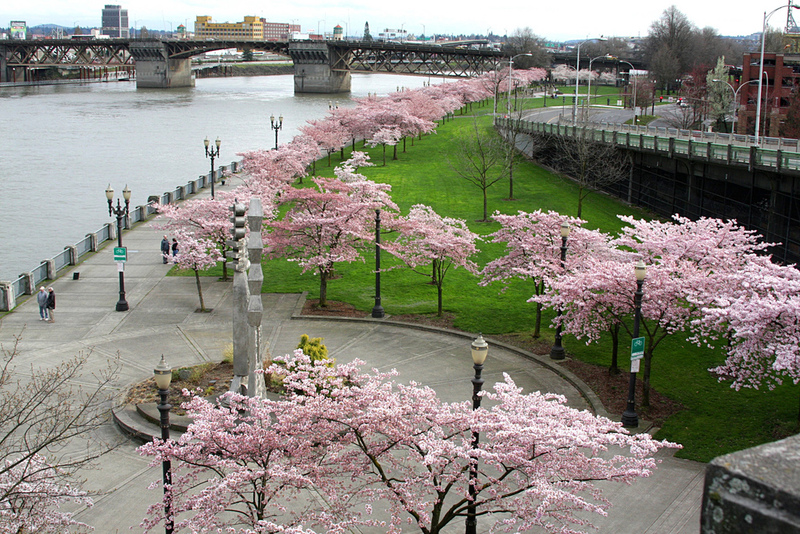 The waterfront in Portland is gorgeous! 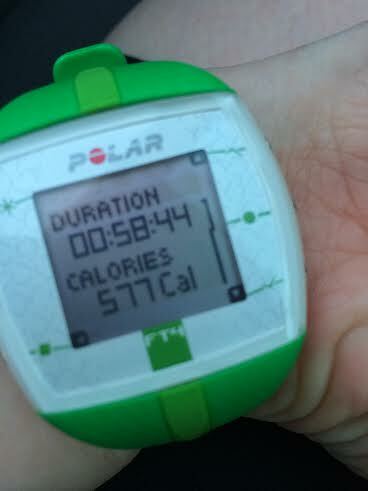 Hoping I will be back up to running more mileage this summer so I can run the loop during my lunch break. We just got something like 8 inches of snow yesterday! I just want to see the ground. That first shot looks amazing! Lori recently posted..Counters are done! I saw! You poor thing!! We had nice weather for 1.5 days and now we are back to windy winter weather! Your first picture is amazing. Your cherry blossoms are a little ahead of us, but we’re catching up. LOVE the photos, and look forward to your good news! Have a great week Lisa. They are so beautiful–my favorite part of spring! and GIDDDDY WEEKEND HERE TOO. Carla recently posted..Food with BENEFITS (who’s down wit’ F.W.B.?). Pizza looks great !!! the weather has been so good that you want to be healthy and active. Yes! Nice weather definitely makes me want to get outside and be active.